« Merlin Open at the Harp. It’s a Merlin Jim, but not as we know it! 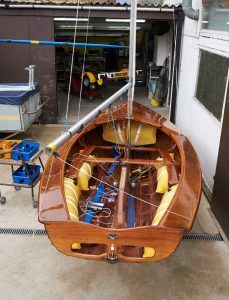 We have just finished the fitting out of Geoff Baylis’s lovely Proctor 9 beautifully varnished by Ben Dingwall. I photographed it in our exciting exterior sales facility (yard) and the daily throng of punters have all admired this 60 year old boat. Most of them only familiar with white glass fibre dinghies asked what it was. None of them thought it was a Merlin. My son who works in IT came over and I asked him to explain the mystery that is Social Media. I also asked him to check our progress in Face Book, he carefully went through it and after a while dutifully informed me that I still had no friends, all I had done was steal all of his. So to all of Toms friends THANKYOU!